The Feetures! Plantar Fasciitis Sleeve is a unique approach to providing relief of PF symptoms. Unlike other, cumbersome night time only approaches, the Feetures! PF sleeve is easy to slip on, easy to slip off. 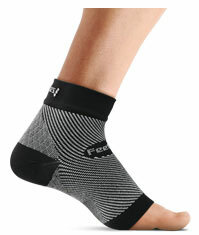 And, importantly, it can be worn comfortably under socks when active during the day providing extra support. It can also be worn while sleeping to reduce morning heel pain. With the Feetures! 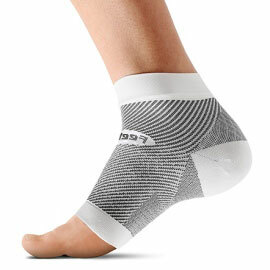 Plantar Fasciitis Sleeve there is finally an effective and convenient way to relieve PF symptoms. ...oh did we mention that it won the 2012 "TRE-Mendous Product of the Year" at The Running Event in Austin? FS6's graduated compression, light-weight construction, and open-toe construction allows you to wear the Plantar Fasciitis sleeve 24/7 for pain-free day or night.